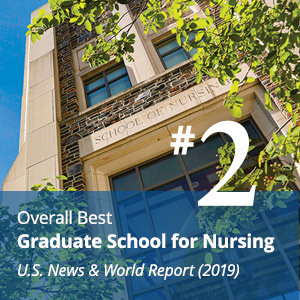 A diverse community of scholars and clinicians, Duke University School of Nursing is educating the next generation of transformational leaders in nursing. We advance nursing science in issues of global importance and foster the scholarly practice of nursing. We have been ranked second in the nation by the U.S. News and World Report for its 2019 Best Nursing Schools rankings. The School offers master's, PhD and doctor of nursing practice degrees as well as an accelerated bachelor of science in nursing degree to students who have previously graduated from college.